The 2nd round (itinerary attached) of the 39th edition of the National Cricket Championship (NCC) will start on Monday (18 March) at Cox’s Bazar. 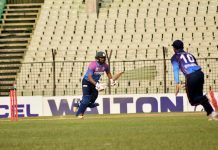 Sixty-four district teams had participated in the first round of the limited overs competition split into two Tiers. The top finishers of each of the eight groups in Tier 1 have qualified for the second round.